Check details of Aiou Tutorship 2019 from here. 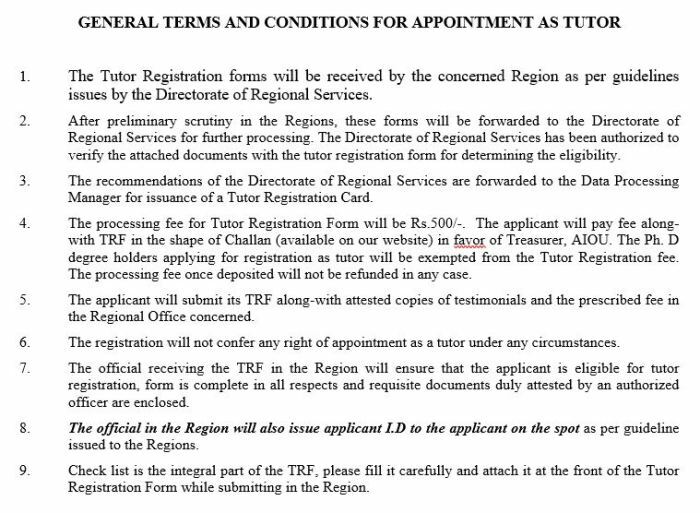 Moreover details of Tutor jobs as well aiou tutor information & aiou tutorship form available here. Moreover, aiou tutorship registration form last date & how to apply for aiou tutorship details are available here. The Allama Iqbal Open University is a public university in Islamabad, Pakistan. The university is the world’s fourth largest institution of higher learning, with an annual enrollment of 1,121,038 students, the majority are women and course enrollment of 3,305,94. The university has 44 regional campuses and centers throughout Pakistan. Allama Iqbal Open University is an attractive option for common people who can not afford highly expensive education in Pakistan’s private universities. Online learning is mostly offered free or at a minimal cost to the consumer. Details about aiou march jobs 2019 are mention below. Allama Iqbal open university is hiring tutor for the year 2019. Both the genders can apply. Aiou Tutorship jobs is part time jobs. In every semester, Allama Iqbal Open University hires a large number of Teaching staff called as “Tutor”, for the purpose of teaching into various courses, ranging from secondary level to Ph.D degree. Tutorship advertisement are publish in the newspapers. Allama Iqbal university receives a large number of applications. Those candidates are selected who are eligible. The applicants are selected on a competitive basis. After registration Aiou issued Registration Card. Tutorship jobs of aiou are part time jobs. Male as well as female can also apply. Aiou select tutors for post graduate, BA, Bed, CT, HSSC FA Inter, PTC, and SSC, FA, BLIS & MLIS. The Tutor Jobs are open in these cities, Saidu Sharif, Sargodha, Sialkot, skardu, sujawal, sukkur, Toba Tek Singh, Turbat, Vehari, Karachi, Abbottabad, attock, chakwal, chitral, DG Khan, D.I Khan, DRS Office, DADU, Dera Murad Jumali, Faisalabad, Gilgit, Gujranwala, Hyderabad, Islamabad, Jhang, Kalat, Kasur, Kohat, Lahore, Larkana, Mandi Bahauddin, Mianwali, Kamalia, Multan, Muzaffarabad, Narowal, Peshawar, Quetta, Rahim Yar Khan, Rawalpindi, Sahiwal, and Zhob cities of Pakistan.